Technology has been around since the start of time—some argue it dates back to the Neanderthals’ use of rocks as tools. Of course, it’s evolved tremendously over the past thousands of years. After all, today we have technology for our technologies, meaning apps for our phones, tablets, computers, etc. Authored by Jason Stahl, then-managing editor, the article impresses that technology eases workflows and allows landscape contractors to mobilize their offices. “Let’s face it: landscape work is outside work, so anything that can get you out of the office but maintain your level of productivity is a good thing, right?” Stahl writes. He went on to feature landscape professionals who relied on technology for their operations or were headed that way. 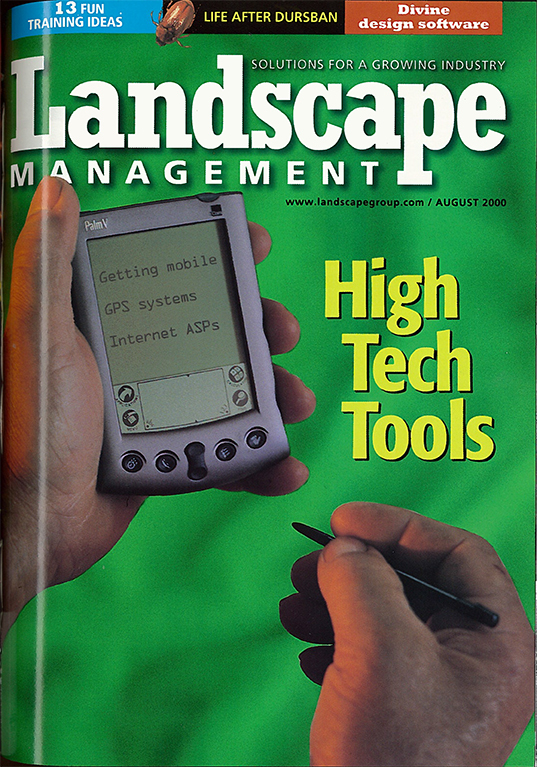 Dwight Hughes, president of Hughes Nursery & Landscaping in Cedar Rapids, Iowa, invested in four PalmPilots to have work information accessible on-the-go and at home. The downfall of the device, Hughes said, was he had to plug into his computer to transfer invoice information. And while Laurel, Md.-based Bozzuto Landscaping and Dallas-based BLT Landscape Services were still using PCs at press time, both companies were working to replace their desktop computers with laptops for managers to take on the road. Bozzuto also had recently switched to Nextel phones over pagers for the text paging feature. Meanwhile, Heard Gardens, based in Johnston, Iowa, was considering using the company website to fill plant orders and weighing the decision to equip trucks with GPS devices. It’s likely some landscaping operations may still be using these tools. And if yours falls into the count, don’t stress over being outdated. Using technology period is increasing your efficiency…but, please, don’t qualify flint tools as a throwback device for trimming hedges.